More than snorkeling! Please try Sunuba! Sunuba is patented in a safe and unique shallow water diving system. 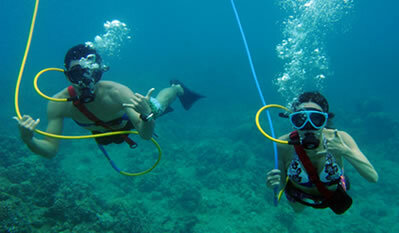 Intended to position between snorkeling and scuba diving, qualification is not required. 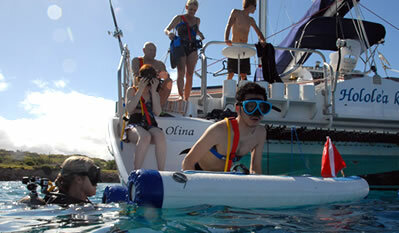 This without having experienced a snorkeling before, even if you do not have only basic swimming techniques, Sunuba couples and family, you can feel free to use for children over 8 years old. 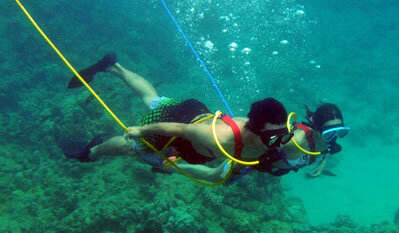 Divers Sunuba will breathe underwater through the air line of 610cm that Tsunagi’ to the standard of the scuba tank. Tank is attached to the surface of the sea of the boat to move freely in accordance with the come your motion. Because there is a air line, bottom of the sea, the sea, you will be able to freely move the surface of the sea. It does not heavy diving equipment Ha. Always accompanied by diving professionals in Sunuba, do the initiation for the equipment of Sunuba to be used, note briefly please explain such matters in water. During the dive, never leave more than 610cm from the safety device of the boat floating in the sea. Diving time is approximately 30 minutes. One of the world’s leading resort activities of the rising popularity we will guide you. Sunuba is only Available in catamaran sailing and snorkeling tour, you will need to purchase as an additional option of sailing and snorkeling tour.